You need to be sure-footed and have a head for heights, so that the tour will be a real joy. For hikers with via-ferrata experience, two lofty "iron paths" are options offering additional thrills. or can be downloaded here for free. 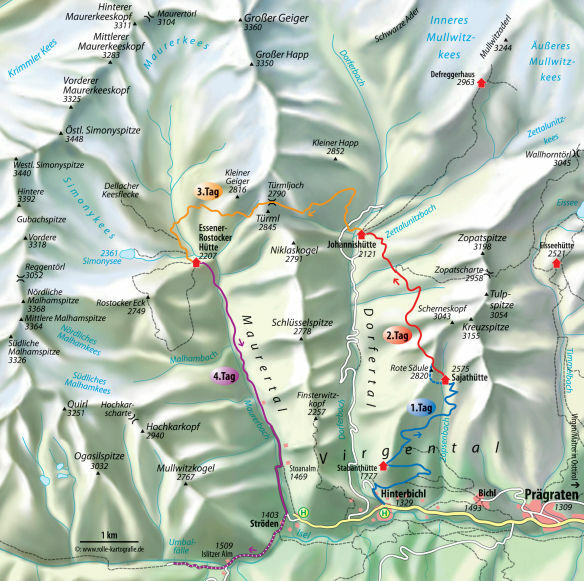 Travel comfortably by bus and rail into the Virgental (valley) at the foot of the Venediger range, and in Hinterbichl begin your ascent to the Sajathütte (luggage transport possible via goods cable-car). At the Gasthaus Islitzer follow the signposts to the Johannishütte and Stabanthütte, and wander along a narrow asphalt road a short distance into the Dorfertal until a gravel driveway branches off sharp to the right. After a few minutes, shortly before the Wiesenkreuz (car park), leave the driveway and walk briefly up a steep path signposted to the Stabanthütte and to Bichl. Without much change in altitude but enjoying wonderful views, wander along across the slopes above Hinterbichl. The ascent to the Stabanthütte begins to the left of a farm. It runs steeply up to the woods and runs into the driveway to the hut. Now you can choose: the forest road and the steep path initially run parallel. In a sharp right-hand curve, there is a shortcut to the left that leads directly to the Stabanthütte (1777 m), where you can slake your thirst again before beginning the steep part of the ascent. Now walk 300 metres back along the driveway, until a narrow, wild, romantic path to the left leads upward through the wood. After 20 minutes you will come to the Katinweg trail and now across the Katinmähder and Sajatmähder (pastures) you will continually gain in height. The carpet of flowers covering these high alpine pastures and the wonderful vistas will compensate for the arduous trek upward. After you have crossed the Zopsenbach (stream) and climbed a somewhat rocky terrace, the Sajathütte appears to be within reach. However, the sharp bends along the trail ascending the slope take up another hour, until you finally reach the mountain lodge in the wild Sajat cirque, and have been served fine fare from the hut’s senior host Maria Kratzer. Once refreshed, you have the opportunity to test your climbing skills on the indoor climbing tower, or you can simply enjoy the magnificent view across to the Großglockner. ↑ 600m, ↓ 1050m, 4 hrs. *, a head for heights required. A magnificent mountain landscape with a number of challenges awaits you today. Whoever feels comfortable with via ferrata trails on steep rock faces will get one's money's worth almost on the doorstep. A short, interesting via ferrata leads up onto the Rote Säule (2820 m), which juts out above the mountain lodge like a rugged tooth of rock. Via ferrata equipment can be hired from the Sajathütte against payment of a deposit. Leave your large rucksack at the hut, and you will reach the starting point in 15 minutes. Experienced ferratisti can demonstrate the strength of their biceps on a more difficult version and climb up, clinging to the rungs of overhanging ladders. The most difficult point is to be found here at the starting point – a smooth, overhanging rock wall. As a reward for these chills down your spine, there is the magnificent view from the top, as far as the Julian Alps. The descent leads down through the west flank of the summit across rocky boulder and bands of debris (safety rope) into a wind gap and across a grassy slope to the south. To the left you will reach the hut once more, where you can fortify yourself again, before you take on the ascent to the Kreuzspitz. Climb once again past the Rote Säule, upward and across the Tanzboden until a short but steep path at the end of the basin, partly secured by cables, leads up to the Kreuzspitz (3164m). At this highest point of the Venediger tour, a fantastic panorama opens up: You are suddenly confronted by the icy monarch of the Venediger range, the Großvenediger, with her entire royal entourage. The following descent requires concentration and a sure-footed step. Initially it leads steeply down towards the Tulpscharte, where the trail forks off to the west, and then follows the mountain flanks into the valley, merging with the Venediger High Trail (No. 929). It meanders down to the Johannishütte below. You can relax here on the sun-terrace, marvel at the glacier giants behind the hut or perhaps let off more steam among the boulder forms nearby. Following recuperation in the hut over night and a plentiful breakfast, wander along a section of the Venediger High Trail in view of firn-glistening Venediger peaks across the Türmljoch col into the Maurer valley. Cross over the Zettalunitz stream behind the Johannishütte, keep to the left after a short ascent and traverse the Dorferbachschlucht (ravine). The steep path heads towards the rocky crest of the Aderkamm, which is circumvented quite steeply to the right. Small cairns lead the way westward ascending further, until you arrive at the Türmljoch col (2790 m). Deep down in the Maurer valley you can already see the end of today’s stage, the Essener-Rostocker-Hütte. Mighty, ice-encrusted three-thousanders glisten above it. An additional via ferrata activity awaits experienced mountain climbers here, who have the necessary equipment with them: Across the north rim of the Türml, a cable and iron clamps lead up steeply and airily to the summit (2845m). There is an easier, pathless possibility to descend towards the south. To the west, passing beneath the rock faces you will once again meet up with the main route and climb down over several sections penetrated by rocks, and in many sharp bends, into the Maurer valley. On the valley floor, cross over the Maurerbach (stream) and follow it out of the valley to the Essener-Rostocker Hütte, which lies at the foot of impressive glacier peaks. More than 20 three-thousanders rise up skyward in the vicinity of the hut. Enjoy the view of the magnificent mountain scenery from the hut’s terrace and enjoy some of the treats from the hut’s kitchen. Those who still have some energy can set out on a side trip to Simonysee lake with the glacier of the same name behind it (45 minutes). To conclude these exciting days on tour in a fascinating high-alpine landscape, spend today quite relaxed, wandering down through the Maurer valley. In broad sweeps, the path leads down to the east, crosses the Maurerbach and leads somewhat flatter past the Ochsnerhütte out of the valley. An array of serpentine curves leads down across a wooded scarp. You can soon stretch your legs somewhat and then amble further downhill across alpine pastures. At the lower end of the goods cable-car you will come to a forest path, which will bring you in 10 minutes to the Stoanalm (1469 m). Once more, you can enjoy a splendid meal here, and stroll thereafter quite relaxed on the road-track to Ströden at the end of the Maurer valley. A crowning finale to your tour is a visit to the Umbal Falls. This impressive natural spectacle can be reached on foot from Ströden on a road-track (30 minutes) or by horse-drawn carriage. At both refreshment stops, at the Islitzer-Alm and Pebell-Alm, a waterfall observation circuit begins, with display boards and viewpoints along the wild foaming stream that has created impressive rock formations. After experiencing these wonderful sparkling cascades, return to Ströden, where a bus via Hinterbichl to Matrei in East Tyrol runs from mid-June to mid-September, two to three times a day. There is also a taxi-telephone available. * Indicated are the cumulative heights in ascent and descent as well as the total walking time without breaks. Please note: All DAV-maps can be purchased at our service-points in Munich, located in the Globetrotter at Isartor, in the Sport Schuster at Marienplatz or the DAV Kletter- und Boulderzentrum in Gilching. In Kitzbühel you can take the bus heading to Lienz (1 hr. 15 min.) to Matrei in Osttirol. There is a bus heading to Virgental and Hinterbichl. Take the A 8 and the A 93 to Kufstein, further on to Kitzbühel, Mittersill and through the Felbertauerntunnel to Matrei in Osttirol. Head western into the Virgentaland to Hinterbichl. 211 km, 3 hrs.